This story originally appeared in the June 2015 Saddlebag Newsletter of the World Methodist Museum available at methodistmuseum.com/about-saddlebag-notes/. Bishop Woodie W. White, Bishop in Residence, Candler School of Theology, Emory University, has accepted an invitation from the Friends of the World Methodist Museum to speak at its annual banquet on Friday, August 21 at 6:30 p.m.
From 1969-1984, he was General Secretary of the General Commission on Religion and Race of The United Methodist Church. Elected a bishop in 1984, he served the Illinois Great Rivers Area prior to his service in Indiana, from which he retired in 2004. He was president of the General Board of Discipleship from 1988-1992 and president of the Council of Bishops in 1996-1997. 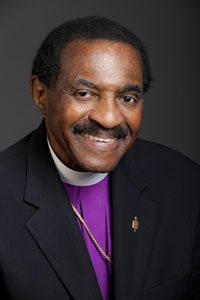 Bishop White was elected to the Martin Luther King, Jr. International Board of Preachers at Morehouse College in Atlanta, Georgia. Bishop White was an active leader in the civil rights struggle in the U.S. and continues to teach and work for racial justice. He worked closely with Dr. Martin Luther King, Jr. and pens a letter each year to Dr. King on the current situation of race relations in this country. Friends of the Museum President, the Rev. Dr. Donald Rankin, says the Friends are especially pleased to have someone of Bishop White’s note and leadership to speak at the banquet. “It is important that all of us in the Methodist and Wesleyan family strive to remind each other of the continuing need to work for justice in the world. The Museum highlights the many ways Wesley and other leaders worked for social justice in the 1700’s, and Methodists of all denominations continue this fight. A Committee of Friends is planning the meal and related activities for the evening. The banquet will be Friday, August 21, at 6:30 p.m. in Lambuth Inn’s International Room. Send your check, call in a credit card number, or visit us and bring your payment by the Museum. The cost of $20 per person may be paid by check, cash or credit card. Reservation is through payment; receipts are issued but no tickets will be distributed. Open to the public, further information about the Banquet is available by calling Museum Director Jackie Bolden at (828) 456-7242.